North Dakota Means Legendary Fishing. Here are some maps and other information to help you. Missouri River System - North Dakota’s Missouri River System is a tale of four distinct bodies of water, each with its own special characteristics. The Upper Missouri - The Missouri enters North Dakota from Montana and flows freely for many miles until it calms down at the headwaters of Lake Sakakawea . This upper Missouri stretch, joined by the Yellowstone River just inside the state’s borders, is where sauger bite well in spring and fall, northern pike inhabit many backwaters, and catfish much of the open-water season. Lake Sakakawea - Lake Sakakawea starts just south of Williston and stretches out more than 150 miles to the southeast where it is contained by Garrison Dam, one of the larger earth-rolled dams in the world. Walleye attract considerable attention from Sakakawea anglers throughout the reservoir...Northern pike, North Dakota’s state fish, can grow larger than 20 pounds and cruise hundreds of bays that add up to the lake’s more than 1,300 miles of shoreline, almost all of which is publicly owned. The deep, cold water of lower Sakakawea harbors chinook salmon, while the northern face of the dam and underwater rocky points and islands support a tremendous smallmouth bass fishery. White bass, yellow perch, crappie, sauger and rainbow and brown trout are also plentiful in certain parts of the lake. Central Missouri River - From Garrison Dam, the Missouri River resumes its natural course, flowing cool and clear until it reaches Lake Oahe’s headwaters some 75 miles downstream to a point about 20 miles south of Bismarck and Mandan. Just below the dam, the Garrison Dam Tailrace is one of the premier fishing spots in the state. State records for chinook salmon, and brown, rainbow and cutthroat trout were caught within 20 miles downstream of the dam. Walleyes are found in this entire stretch of river, with impressive spring and fall runs. Lake Oahe - North Dakota contains about 60 miles of Lake Oahe, which extends another 120 miles into South Dakota, where it ends at Oahe Dam north of Pierre. North Dakota’s portion of the reservoir supports a walleye and northern pike fishery, along with seldom tapped but enticing crappie, catfish and white bass possibilities. Devils Lake - Once known primarily for its jumbo perch caught through the ice, Devils Lake has grown, in more ways than one. Northern pike, walleye, white bass and crappie all compete for angling attention year-round. While the lake has tripled in size since 1992, fish populations have kept up with expanding water. Pike cruise in and around flooded trees. And when you find a school of white bass, these plate-sized fighters will nail your lure on almost every cast. Walleye and perch are plentiful and ice anglers still come from far and wide in quest of perch that push two pounds. The Game and Fish Department is your source for up-to-date fees and regulations, call 701-328-6300. This article was taken from North Dakota Tourism Site. New for 2007! 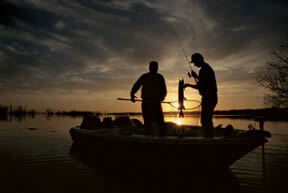 Devils Lake is North Dakota's premier fishing destination and draws anglers from throughout the United States. Most noted for its outstanding winter perch fishing, the lake also has quality pike and walleye fisheries, fishing this lake is not to be missed. Map Features: Lake Profile, Fishery Information, Tips and Techniques, over 80 Fishing Points of Interest with GPS, 55 Marked Fishing Locations, 12 Access Locations, 15 Referential GPS Waypoints, and all new FHS Cartography and Look. Set of four maps - are printed, water-proof. High Definition Fishing Maps for freshwater lakes of the United States. The information on the maps has been obtained by detailed, on-site surveys of the lakes. These surveys supply more depth and contour information than usually found on other lake maps. This information is invaluable to fisherman, and equally useful to other boaters.